Swarovski - SNOW WHITE AND FOREST ANIMALS, L.E. Nielsens Gifts Home Shopping Cart Page > Gifts for Her > Swarovski - SNOW WHITE AND FOREST ANIMALS, L.E. One of Disney’s most iconic princesses enjoys a spectacular Swarovski makeover in this detailed depiction of Snow White. 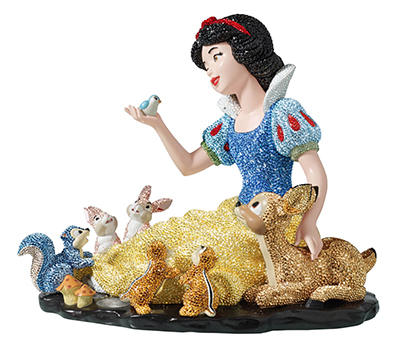 Glittering with over 31’000 crystals set in the Pointiage® technique, the much-loved character sits surrounded by adorable forest animal friends, including a deer, chipmunks, and rabbits. Swarovski artisans dedicated over 243 hours to complete this nostalgic masterpiece, which is presented on a black granite base engraved with the edition number. Limited to just 250 pieces worldwide, this is a highly exclusive collector’s item and will be delivered in a premium blue suitcase with a certificate of authenticity.